My past review of “Snuff” was an entirely negative one…A film I bashed as one of the worst ever and no doubt of all time. “The Place Promised in Our Early Days” is something I have been meaning to see for a while now and I finally found a DVD after months. 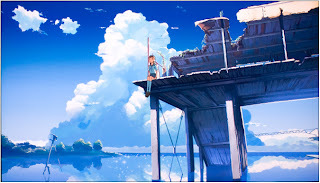 Makoto Shinkai seems to have it big with impressive settings and visuals with the limited budget he works on and I won’t lie how I had little hope for this film I have been searching for after so long. 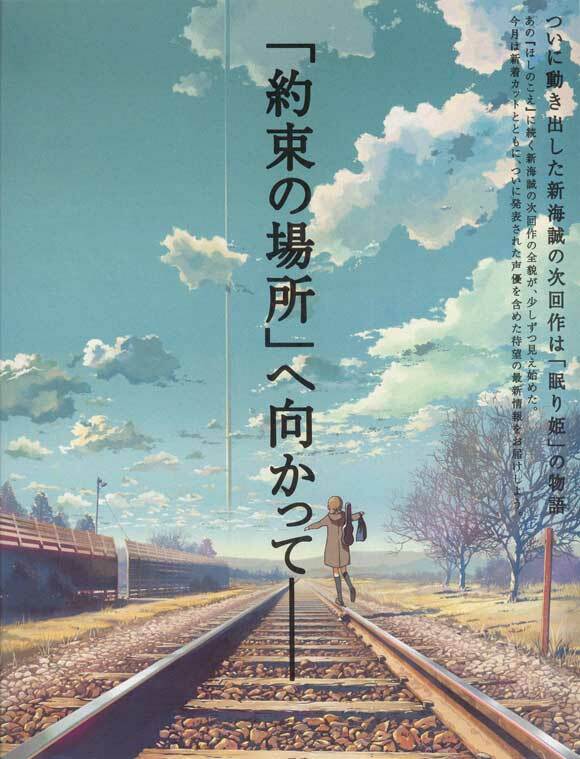 I only got this one after I viewed his “5 Centimetres per Second” and “Voices of a Distant Star”. Many things come to your mind while you’re watching one of his films...Unforgettable…Fantastic…And extremely emotional. I will admit I was a bit worried to know if I would be bored out of my mind, But too be open I was so taken by surprise with this animated epic as many would call it. I watched this one late night and there was not one single second that I doubted or hated it in anyway at all…If so it’s one of the best films I saw last decade (In the top 5 for sure). In a world where Hokkaido separated from mainland Japan in the early '70s and formed and independent nation called The Union, middle school friends Hiroki and Takuya share two common interests: a girl named Sayuri and a plan to build a plane to fly to the mysterious tower they can see across the straits in Enzo (aka Hokkaido). Both pledge to fly there with Sayuri one day, but time and circumstances separate the trio before the plane can be finished. Years later, with war looming on the horizon, their paths cross again as the two boys learn that Sayuri has been asleep for years and cannot wake. 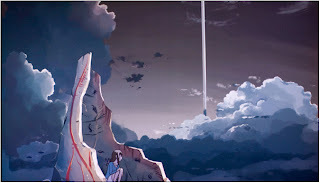 Somehow her condition is connected to the mysterious tower and interaction with parallel universes, but in her dreams Sayuri awaits for an old promise to be fulfilled—and holds the key to the world's salvation. Story… Many will simply say it drags at times and other see it can be very complicated but personally I thought it was a great…No sorry rephrase an excellent and pretty unforgettable experience watching this. 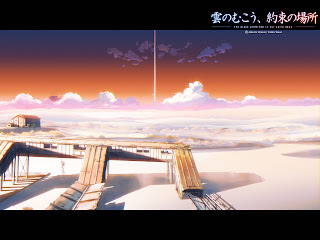 I’m not the biggest fan of Anime I only watch the stuff that interests me but just the storytelling and it all the way throw did nothing but make my Jaw drop not just its insanely amazing visuals. I will surely add it to my top 20 very soon but before then I have never been touched by how incredible one can be when their all by themselves (the emotional part). Acting… While it’s pretty nicely done nothing more I can really talk about but there is and we have here Hidetaka Yoshioka, Masato Hagiwara, Yuuka Nanri and of course Kazuhiko Inoue who did the dub for major horror movies back in the 80s such as Zombi 2. He also starred in (Live action) in Roger Cormans “Up from the Depths”. Production… While some amazing and some inspiring scenery that just makes me wish I went and finished my Animation and Media class, All that stuff only comes from one’s Mind and Soul. 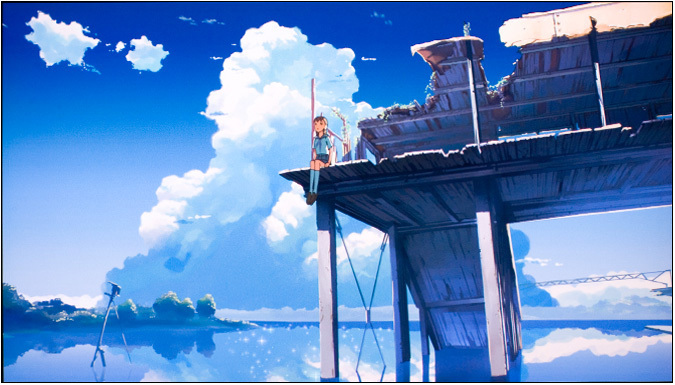 How Makoto Shinkai created all those stunning scenery’s and backgrounds is just simply beyond me…I have never ever had the pleasure of viewing stuff such as this. And the amazing blend of different colours was awesome. I will admit the characters themselves look kind of rushed because of the time they had…But hell never bothered me. The music is really good and as for the rest including the direction just excellent. Final… Maybe I haven’t convinced you enough that’s my problem but I will Re-write this soon…Don’t be put off by anything I can guarantee you won’t hate it but love the emotion and everything else that flows with this soon to because one of my top 15. Incredible review Jesse, I immediately looked up this film on netflix, and it is an instant watch! Score! Lol, i'll be viewing this soon, thanks for the suggestion. Your welcome i hope you like it! I'm watching this film on Netflix at the very moment actually lol and I thought i'd stop by real quick, because already this is one of the most beautiful animated films i've ever seen! AWESOME! I'm glade you liked it, One of the better animated films i have seen for this time of age! Haha thanks again Matt glade you liked it!